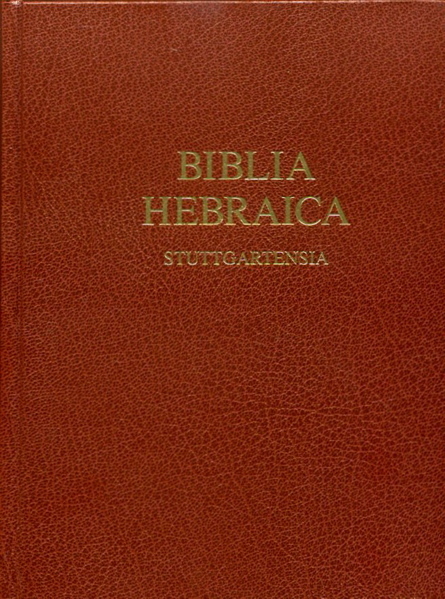 The Biblia Hebraica Stuttgartensia (BHS) with Critical Apparatus contains both the main text of the BHS as well as the critical apparatus. The BHS is the most widely used scholarly text of the Hebrew Bible. This text was originally edited by Karl Elliger and Wilhelm Rudolph in cooperation with numerous other scholars, and the revised 5th edition from 1997 was prepared by Adrian Schenker. It is based on the St. Petersburg Public Library manuscript B19a (the so-called Leningrad Codex). While the main text of the BHS follows the Leningrad Codex almost exactly, the Critical Apparatus provides readings from a variety of other sources including the Dead Sea Scrolls, the Septuagint, the Samaritan Pentateuch, and the Targums, among others. The Michigan-Claremont-Westminster Morphology database offers high-quality glosses, parsing codes, and the Hebrew lemma for each word. Our electronic edition of this text uses the beautiful Ezra SIL font, which is based on the font used in the printed edition of the BHS. The Bible Study App also supports a unique method of displaying the Hebrew fonts without having to install them. Please Note: This edition of the BHS contains the text of the BHS, the apparatus and the parsings. It is also available in packages that contain just the text and apparatus. BHS with apparatus (no parsings).